The following is part of our Member Spotlight series. Twice a month, the PPRA blog will feature a profile on one of our members. 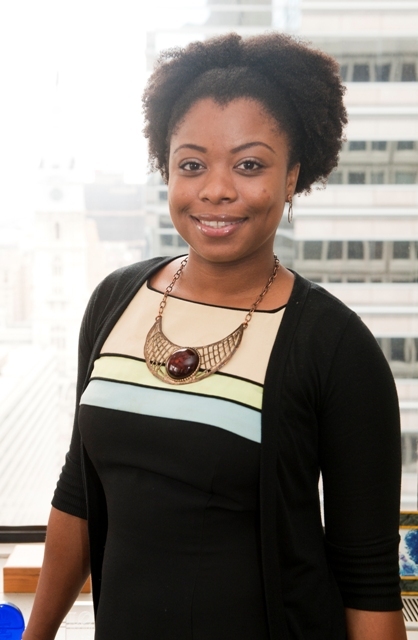 Today’s post highlights PPRA’s Community Service Chair Khaila Edward. After attending a number of events as a non-member, I finally joined PPRA in 2012. My undergraduate degree is in Advertising and Graphic Design with a sprinkling of PR electives but after a PR internship at cause communications firm GMMB in Washington D.C. exposed me to how public relations can truly shape perceptions, I realized that my strengths as a writer were better suited to the PR industry. After college, I worked briefly in PR at LevLane, in marketing for a global refrigeration distributor and while getting my Masters in Communication at Villanova, found my way back to PR at the PHLCVB. I’m currently the Communications Manager at the Philadelphia Convention & Visitors Bureau (PHLCVB), where I work to raise Philadelphia’s profile as a national and international meeting, convention and sporting event destination through media relations and social media. I love that every day is different. One day I could be writing a press release about a convention of orthodontists coming to Philadelphia and the next I’m promoting the National Curling Championships. There is always something new to experience and to learn at my job, which keeps me on my toes and challenges me professionally. I am very interested in PR measurement at the moment. Tying PR efforts to impact on business has always been challenging and with the development of the Barcelona Principles for PR practitioners I love that there is now more conversation about global industry standards, legitimacy and how our jobs really impact business outcomes. I would love to see more academia injected into PR. In my personal life I tweet a lot and am also active on Instagram, Pinterest and Facebook. I don’t use Facebook for business at all but will sometimes use Twitter to reach out to media. I also manage the PHLCVB’s @meetPHL Twitter account. My advice would definitely be to hone your writing. Fall in love with grammar, read as much as possible and expand your vocabulary. A well-written cover letter or writing sample catches my attention every time. Also, don’t be afraid to pick up the phone, be tenacious and people will take notice. There are too many favorite things to name but it would probably be Kelly Drive during the summer. I’m originally from Trinidad & Tobago and only moved to the US for college (H-UUUUU!). This entry was posted in Member Spotlight and tagged Communications, Conventions, Member Spotlight, Philadelphia, Philly, PHL, PHLCVB, PR, Public Relations, Social media, Tourism by pprablog. Bookmark the permalink.